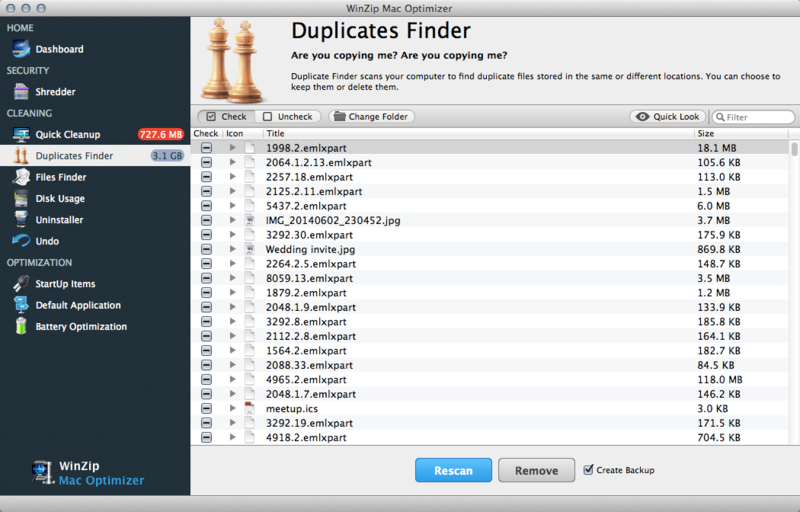 The Duplicates Finder feature in Mac Optimizer can instantly scan your entire Mac and sort all the files on the system, showing you all the files that are duplicated across different folders. Then, you can easily remove the duplicates. Once the scan is complete, click the arrow next to any duplicate file to see the different folders where the files reside. Select any files you’d like to remove one of. You can choose which duplicate to remove by clicking the arrow. You can sort this list by size to find the duplicate files taking up the most space or search for a particular file or file extension. Make sure that you are not removing any files that you want to keep. Click Remove to remove one of the duplicate files. How do I use the Backup and Undo function of Mac Optimizer?